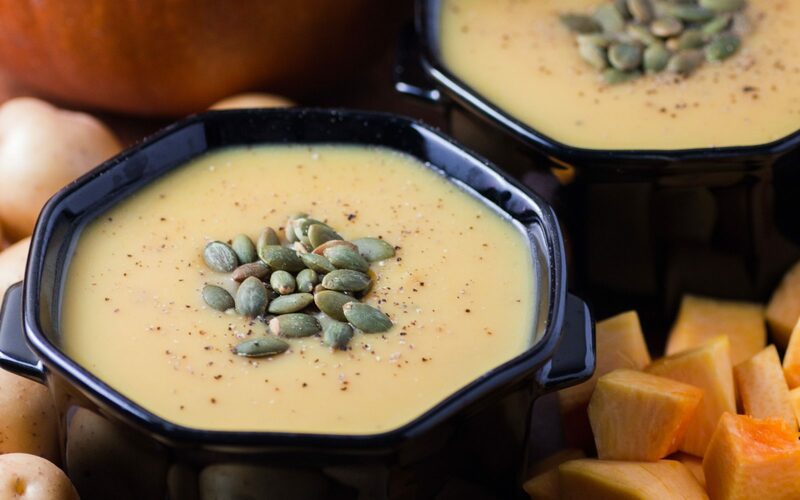 A Creamy Little Potato Pumpkin Soup that uses versatile Creamer potatoes and sugar pumpkin, perfect for your holiday table! In a large pot melt the butter over medium heat and sauté the garlic and the onions until translucent. Add the pumpkin, potatoes and stock. Bring up to a simmer, add the red pepper flakes, nutmeg, salt, pepper and ginger powder and stir well. Let simmer for 15 to 20 minutes, or until the potatoes and pumpkin are very soft. Purée with a hand blender or blender until smooth. There may be still some skins that don’t blend and that adds a nice texture. Add the cream and return to heat. Serve hot and garnish with pepitas and fresh ground black pepper.